CNN has paid homage to its star Anthony Bourdain in a tribute show following the celebrity chef's suicide on Friday. The tribute show aired on Sunday night after a new episode of Bourdain's show Parts Unknown, and tracked his rise through footage from past shows and interviews with CNN colleagues. In one surprising moment, CNN anchor Jake Tapper revealed that Barack Obama's appearance on the show was at the request of the then-President himself. In another interview, anchor Anderson Cooper was on the verge of tears as he discussed how Bourdain had inspired him. I just turned 51, and I remember thinking: "Wow if I could age like he is aging." He was 61, and he was getting tattoos, doing jujitsu and he was just, he actually...' Cooper said, trailing off to compose himself. In other footage originally shot for an episode of his show that aired in 2015, Bourdain got painfully honest with a group of recovering addicts in Massachusetts. 'I'll tell you something really shameful about myself. 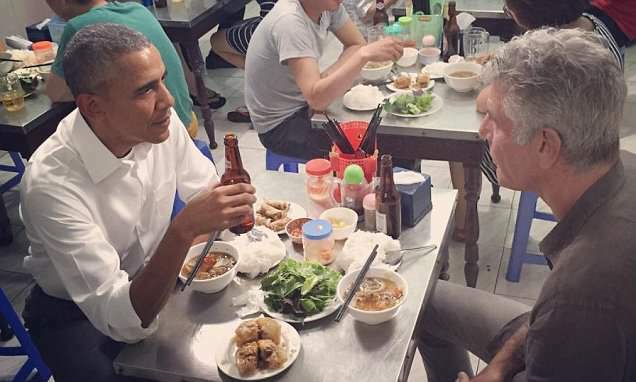 The first time I shot up, I looked at myself in the mirror with a big grin,' Bourdain told the group.